Holden Kennedy is the son of Brett and Lori Kennedy. Holden is currently in his senior year of High School, and has been playing basketball since first grade. 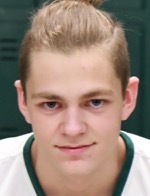 In addition to basketball, Holden is also a member of the Hornet Soccer and Track teams. In his free time, Holden enjoys playing sports and hanging out with his friends and family.